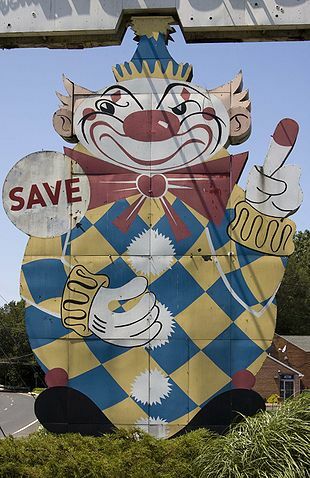 if you’ve traveled on highway 35 through middletown and haven’t seen the ginormous clown on the side of the road pointing his red finger at you and giving you a creepy look, i would highly suggest getting your eyes checked, stat!! why is that clown even there? when did it get built? does it have a name? a side note – Buddy’s g-pa has some history with this metallic beast – from the hubster, ‘babe, tell your blog (i crack up hearing that! ), my dad and his friends were playing on it when he was a kid. His friend broke his arm while climbing it when it used to rotate. They had to hitchhike to the hospital because they were too young to drive and the guy that picked them up didn’t have any clothes on and just had a pillow over his lap’… weird/creepy story right?! what a life! he celebrated his 55th birthday this past january – here’s to many more years of giving highway 35 the stink eye! you may be states away, but we’re always thinking of you in the Jerz!